Consolidated Properties to officially mark the beginning of construction on $400 million masterplanned community - Cornerstone Living. Hutchinson Builders, which will ultimately produce 1,000 dwellings only 12 kilometres from the city’s CBD on the edge of Sunnybank. In addition, a new collection of two and three bedroom terraces - all with street front entry plus large living areas and external courtyards and balconies - will be made available in this new release starting from just $384,000. "The start of work at Cornerstone Living marks the realisation of a vision shared by State government, Brisbane City Council and Consolidated Properties to revitalise a major part of Brisbane's inner south so the area has a more vibrant and liveable future," he said. "State government has recognised the need for new and diverse development on the 10 hectare site and Council has endorsed this suburban renewal through its Acacia Ridge/ Archerfield Neighbourhood Plan released last year. 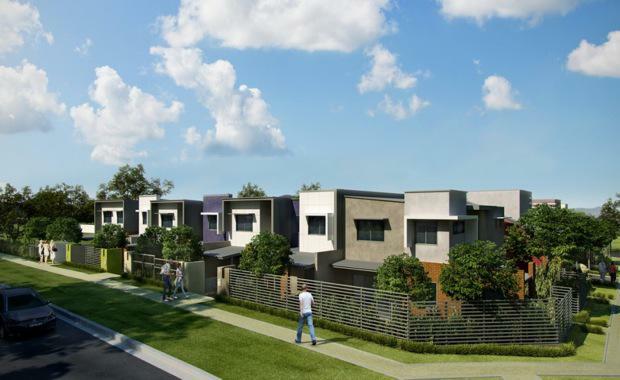 "The Neighbourhood Plan allows for a new mix of dwellings to take advantage of the convenient location within walking distance of two train stations and schools and a three minute drive from the entertainment and shopping precinct of Sunnybank. "Consolidated Properties will bring to reality the vision shared by all levels of Government for Cornerstone Living to integrate with the surrounding community and enhance the liveability and appeal of the area as an affordable and desirable place to live. "Our first stage of terrace homes sold to buyers who could see the potential of Cornerstone Living and how it would change the face of the area to create a cohesive, contemporary community. I expect the next stage of homes will also be taken up quickly - especially as people start to see the first homes take shape." "Over the coming weeks and months a number of public amenities will open on site - including a cafe and community garden, complementing the sales and community centre that has been operating for the past year" he said. "The aim of the Cornerstone Living redevelopment is to deliver real, tangible benefits for the entire community, and these communal facilities are the first step towards that goal. "The development as a whole will generate up to 6,000 new jobs - and it's common knowledge that new jobs and new housing hand-in-hand are important stimulants for the economy."